Firstly, place the dates in a bowl and pour hot water over them. Leave them to soak for a few minutes while you get all your ingredients together and then drain them. To make the base, place the cashews in the food processor and blend until you have a coarse flour. Then drain the dates and add half of them to the food processor. Blend until you have a sticky, crumbly paste. Press the mixture evenly into your baking tin. Then put it in the fridge while you make the caramel. To make the caramel blend the rest of the dates by themselves until as smooth as your food processor will allow. Then add in the almond butter and melted coconut oil and blend to combine. You should get a thick glossy mixture. Pour this over the base layer and place in the freezer for about an hour. To finish, melt the chocolate and pour it over the caramel layer and freeze for about 20 minutes. Slice and enjoy! Store in the fridge. This is my favourite recipe so far! Mmmmmm. This recipe is so good! My favourite so far……..
Love that you’re trying out so many of the recipes! These are one of my favorites too! This is a fantastic recipe! I make it over and over again! Wowwwwww! *Drools* Defo one for me to try!!! 😀 Thank you! Made these today, lovely, thank you. I used dark chocolate (due to allergies) which I did feel overwhelmed them a bit, so probably best to go for milk chocolate toping if you can. Do I need to use medjool dates? I like medjool dates best because they’re so soft and chewy but you can use any kind as long as you soak them until soft! Thanks! They were so super fast to make and I used regular dates for the base and medjool for the caramel. I used 90% Lindt to lessen sugar content! 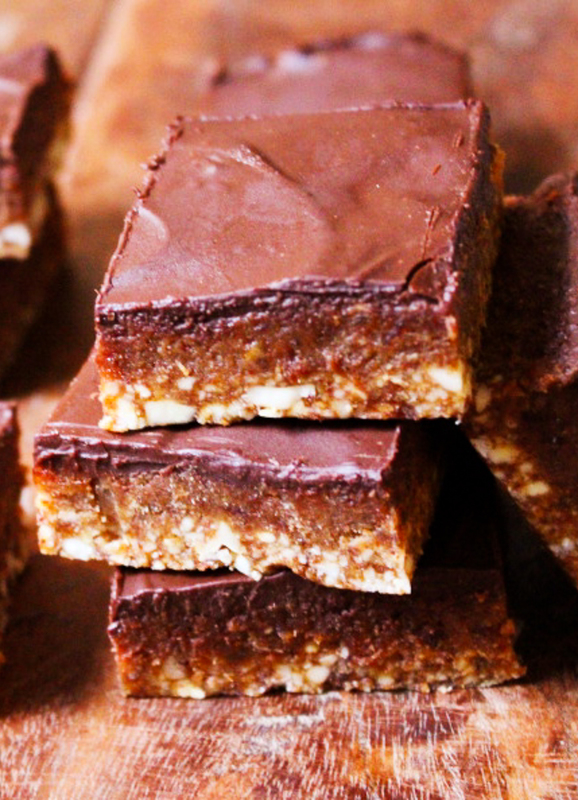 These Caramel squares are really delicious & so easy to make, (give them a try) ???? Can you give the recipe in g rather than cups? Can I ask what size baking tray you used, also did you line and grease it?